You can open the Workflow help from Workflow Designer. To open the help at the beginning, launch Workflow Designer and click the help icon in the banner. You can also open the help to the page for a particular activity by right-clicking the activity in the Activities panel and selecting the Help option. Workflow Designer's Activities panel contains a complete list of the activities that ship with Workflow Designer. 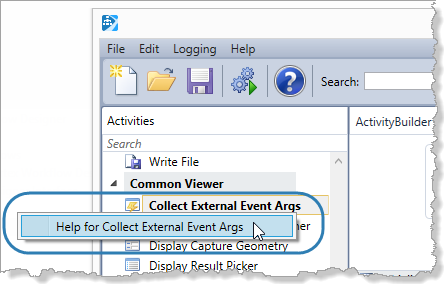 To find out what a particular activity does, position the pointer over the activity in the Activity panel—a tool tip describing the activity will display. To get additional information about the activity, right-click the activity and select the Help option. This opens the Workflow help to the page that provides detailed information about the activity, including information about the activity's function and properties, and suggestions for how you might use the activity in a workflow. One way to learn about workflows is to experiment with the workflows in an existing site. The LA County sample site that ships with Essentials gives you a place to start. The LA County site has several workflows that you can run in the site's viewer. You can also open the workflows in Workflow Designer and examine their configuration. For more information, see Explore a Sample Site. Geocortex Essentials ships with a Workflow Samples site that provides samples of individual workflow activities. You can use the sample workflows to learn how individual activities work. Each sample workflow demonstrates one activity. The Workflow Samples site does not contains samples for all activities. This procedure assumes that you are familiar with Geocortex Essentials Manager, the Geocortex Viewer for HTML5, and Workflow Designer. Copy the Workflow_Samples folder from the Sample Sites folder to the Sites folder. Launch the viewer for the Workflow Samples site. The viewer's Home Panel provides information and links to help you use the Workflow Samples site. The toolbar contains a tool for each sample workflow. You will use these tools to run the sample workflows. Open the viewer's Activity Glossary by clicking the link in the Home Panel. The Activity Glossary summarizes each activity that is available in Workflow Designer. You are now ready to run the sample workflows to learn about the activities that they demonstrate. Choose an activity from the toolbar or the Activity Glossary. Open the sample workflow in Workflow Designer. Viewing an activity's configuration in Workflow Designer at the same time that you run the activity's sample workflow will help you to understand how the activity works. Select the activity on Workflow Designer's design surface. This shows the activity's properties in the Properties panel, so you can see how the activity is configured. Run the sample workflow by clicking the tool in the viewer's toolbar. Follow the prompts that the workflow displays. To open the help file for the activity, select the activity in the Activities panel and press F1. Change the activity's configuration in Workflow Designer, save your changes, and then re-run the sample workflow to see the effect of your changes. Add a new instance of the activity to the sample workflow, configure it, save your changes, and then re-run the sample workflow. Community: The Support Center has a Workflow Community where you can post questions about workflows. Knowledge Base: The Support Center's Knowledge Base has a Workflow and Workflow Designer area that contains articles about advanced Workflow topics. Code Gallery: The Support Center's Code Gallery has a Workflows and Workflow Designer area where you can download sample workflows that have been posted by Latitude Geographics or by Geocortex partners and customers. Ideas: The Support Center's Ideas area allows you to suggest improvements to Workflow and Forms. Videos: The Support Center's Videos area offers videos that show you how to use different activities and form elements. We offer several courses on Geocortex Workflow. Courses are available as a web-based offering or as on-site training.